I’m always eager to help people find a new place to live, in part because I’ve done it so often myself that I feel compelled to re-use this expertise somehow. So in the midst of doing my latest impression of a relocation agent, I thought I’d pass along my tips of finding a family friendly condo. Now there are some things you’ll never know about your condo before moving in. 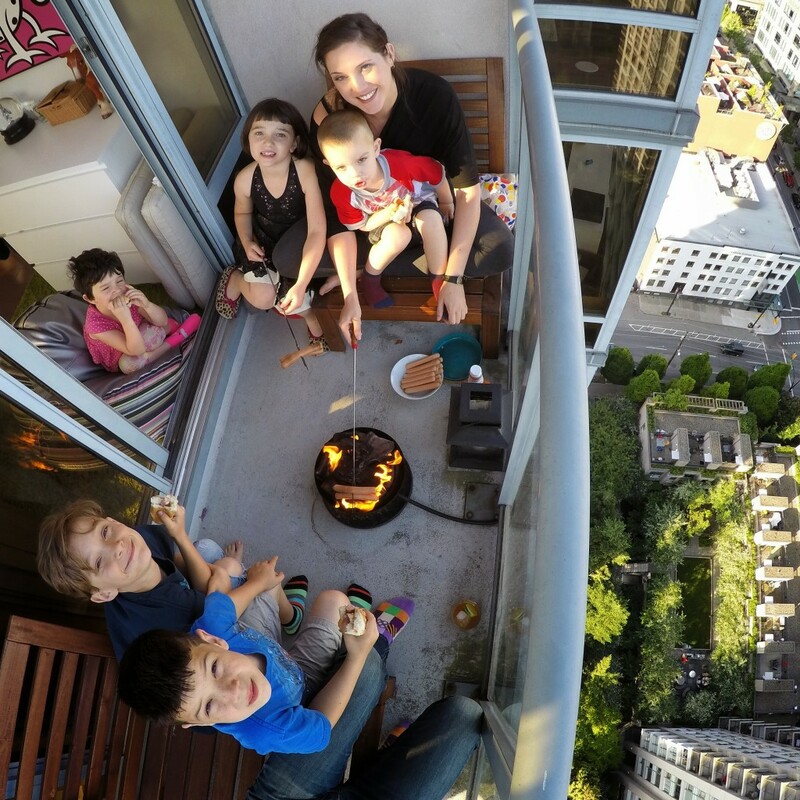 Noisy neighbours, unfriendly strata, too much AirBnB, etc. But here are some of the things you can control, putting the odds in your favour that you’ll find the perfect small place for your brood. There’s not much to this part. The regular sites like Craigslist, Kijiji (here in Canada, at least), individual housing agent sites and aggregators such as Padmapper are great places to start. Padmapper specifically is an easy way to stay on top of the latest postings as it lets you frame a specific location and search criteria and be notified hourly when new places are posted. PadMapper is great for keeping track of multiple listing sources. In a tough rental market like Vancouver, it sometimes make sense to prepare a “sell sheet” about you and your family. I did this recently for a friend who is a single, unemployed mom. By telling her story fully, it overcame potential landlord concerns and gave us a chance to highlight specifically why she’s the ideal tenant. 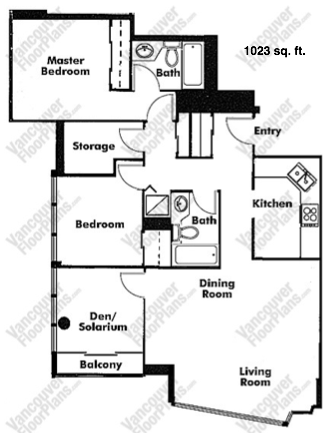 Specific to the Vancouver market, I like to use VancouverFloorPlans.com (paid) to pull up floor plans of specific units. I do this before committing to see them in person as it saves a lot of time to rule out interior spaces that obviously wouldn’t work with my family’s needs. A good floor plan can make all the difference between a large condo that feels tiny, or a small condo that feels spacious. Older buildings have larger floor plans. In Vancouver, anything post-1995 gets considerably tighter, in terms of layout. It’s not uncommon to see 750 square foot condos that are labelled as “two bedroom and den” – which usually means a small, windowless closet is considered a den. Older two bedroom and den units are frequently over 900sqft, which is much more livable. The third bedroom in our condo is a solarium, which meant we had to get creative with space. 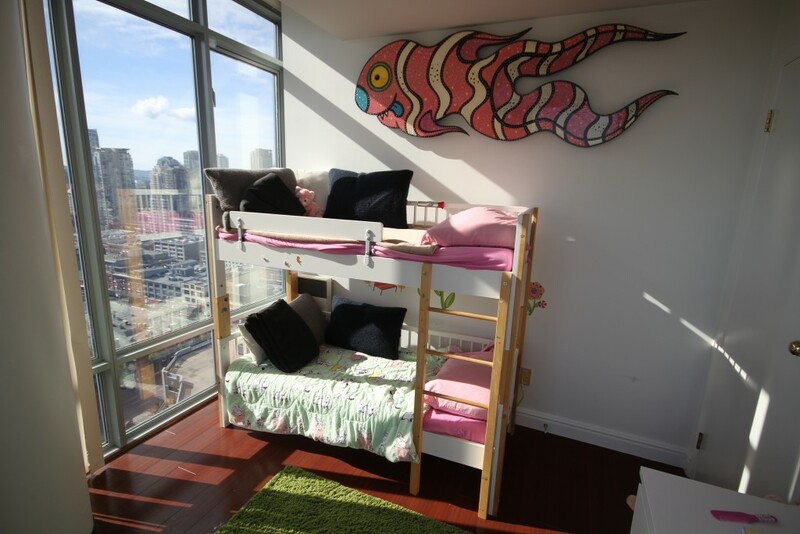 This toddler-sized bunk bed was a custom creation. 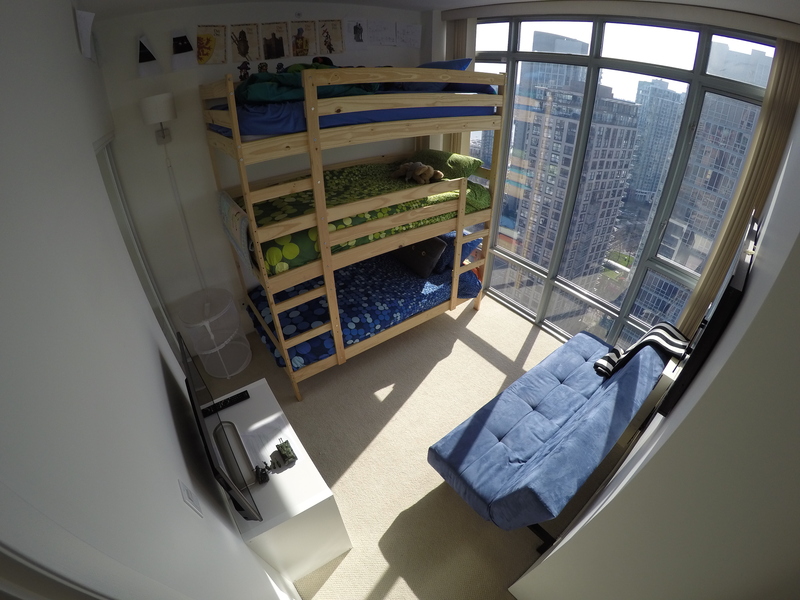 In Vancouver, less than one percent of the city’s rental stock are three bedroom apartments. That means there are virtually no three bedroom rentals on the market. So if you’re looking for a three bedroom place, the size of the den or solarium in a two bedroom condo is crucial. Make sure it can fit a kids bed or bunks. We had to build a toddler bunk bed to fit in our solarium as it wouldn’t take a full sized bunk. 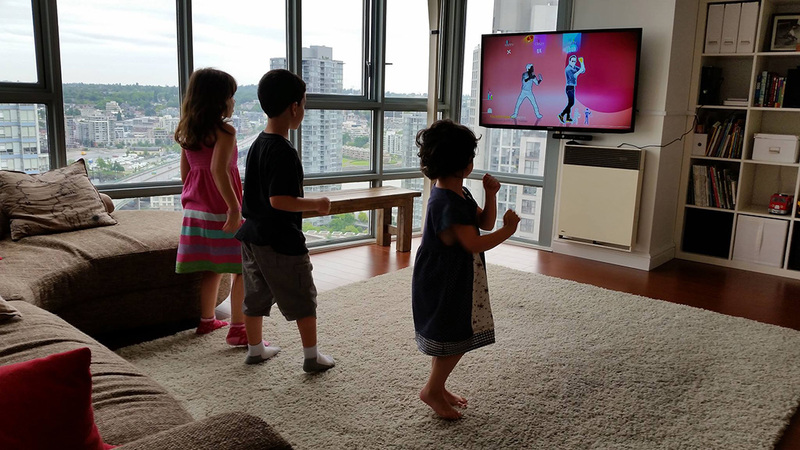 Keeping the living room clear lets the kids play endless rounds of dancing games. Look carefully at the size of the living room. 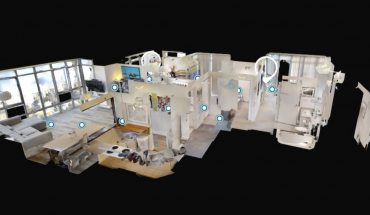 Some condos prioritize a large master bedroom with walk in closet over a big living room, which is effectively wasted space. Newer condos in “design-y” buildings frequently have non-square floor plates, which leads to funky angles and hallways that reduce usable space. But if you’re lucky, you’ll find a condo where the living area is the largest open space in the whole suite, as it should be. In small spaces, rooms need to be multi-purpose. Bedrooms can’t only be for sleeping in. So when you’re looking at small places, don’t panic: with a couple bean bag chairs, a small couch, or a PlayStation, you can turn the kids’ rooms into destinations that will let you enjoy a quiet wine and cheese evening with your friends at the dinner table while the kids play quietly in other rooms. PlayStation (bottom left), triple bunk, and sofa bed – at times this room holds 8 kids (ours + friends), allowing the adults a peaceful evening in the living room. When you’re walking through the unit, consider the separation between the bedrooms where the kids sleep, the living area and your bedroom. It’s unrealistic to think you’ll have lots of buffer space between each (minimizing sound transfer), but some situations are better than others. Glass walls (i.e. solarium walls) between kids bedrooms are not great. A kids room that is accessed through the kitchen may be too close to kitchen noise for the kids to sleep. While I believe kids should be trained to sleep through almost any amount of noise, not everyone has kids who can sleep when Game of Thrones gets cranked in the living room beside their bedroom. 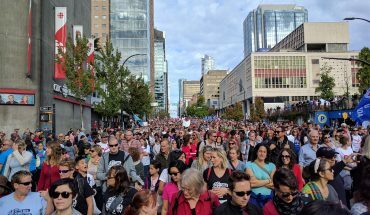 To get a quick idea of how walkable your condo is, check out it’s walk score. It will give you an easy indication of where transit, parks and services are, and whether you’ll need your car much. 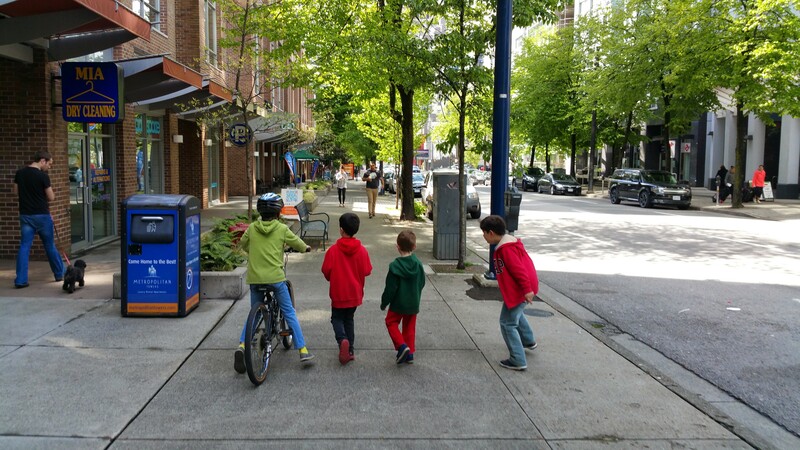 Some of the kids roaming the city on a typical spring day. Newer condos are often more expensive to rent, when really all you’re paying for is shiny new doorknobs and faucets. Don’t get caught up on nice finishings in a rental apartment. Generally, I prefer to stick with “older” units to get more for my money. Take it from me, if you can get two bathrooms, do it. I’m not sure I appreciated this as much as I should have before moving in. We have two bathrooms, but at times I’ve wondered how we’d do it with just one. There’d be a lot of legs crossed standing at the door banging on it if we had 50% fewer toilets. A great view, if you can handle the heights. If you’re comfortable with heights, the higher the better. At least if you’re at all concerned about street noise keeping you up. I’ve lived on the ground level before in a downtown townhouse, which sounds amazing, but at night it felt like cars were driving right through my bedroom. The higher up you get, the more that street noise sounds like a white noise. But with that height comes concerns about kid-proofing the windows. When you’re evaluating places, keep in mind how straightforward it would be kid-proof the windows and patio. 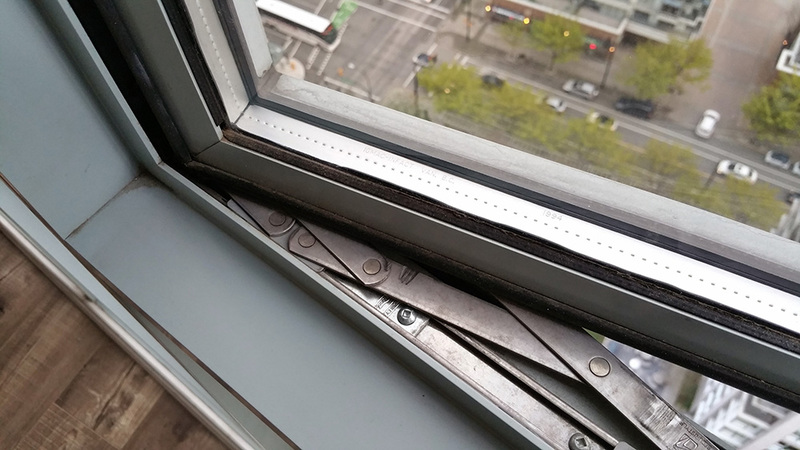 I’ve seen some places that have floor level windows that swing out – a very bizarre design choice that would guarantee I never kept my windows open. A close up of the stoppers we had installed to restrict our windows to opening only about 4 inches. A great way to keep your heating costs down during the winter is to look for Southern exposure. We paid $30/month for hydro over the winter months because the sun kept the place warm enough during the day to avoid using the heat. This is the fun part. I’ve found condo pools are a huge plus, as the kids can easily burn hours splashing around with their friends. Some buildings have playgrounds as well, which may not be of interest if your kids are beyond that age. For adults, a gym in the building might make it easier to pop out for workout if the kids can be left at home or with someone briefly. Even if the gym is a glorified closet, you’re more likely to use it than get to a gym outside the building. 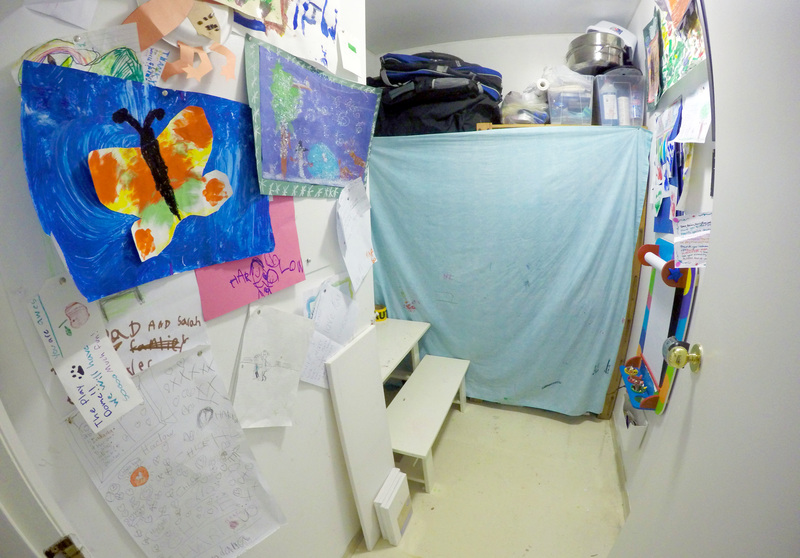 We converted our in-suite storage unit to a kids art room. Way better use of space and we’re not tempted to fill it with junk! Does your prospective condo have a storage unit in the parkade? For us, this wasn’t important. Actually, what we found is that our in-suite storage unit was far better, because we were able to convert it into an art room. If you’re a minimalist like I am, getting this free square footage in your unit to do something useful with is priceless. If you’re not afraid of heights and you trust yourself to manage/supervise your kids’ access to it, a deck is a great plus. We keep ours locked most of the time, but when we do use it, we love it. We’ve added a portable campfire (falls under same regulations as a barbecue), which allows us to roast hotdogs and make smores. It’s certainly not an everyday thing, but it’s a pretty sweet treat for the kids. Us enjoying hotdogs on the deck with the kids. Obviously this is a very carefully controlled activity. Other concerns like bike lockers, how close your parking space is to the elevator (ease of unloading groceries), and in-suite laundry (somewhat vital with a big family) round out the considerations. So you’ve found a place and you’re getting set to move in! Now’s the time to rethink your furniture needs. If you don’t have any, wait for a bit and live in the space before you go out and buy stuff. You’ll better understand what you need. If you’re coming from a house, you might find your house-sized furniture makes your condo seem small. Couches or overstuffed chairs with big arms look absurdly large in smaller spaces. Coffee tables, end tables, A/V units and the like just eat up floor space. You’ll want to use as much vertical storage as possible and do things like mounting your TV on the wall or putting your dressers inside closets to keep the floor space clear. If you have more than one kid, consider bunk beds. 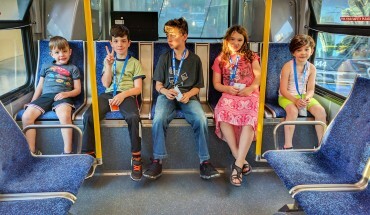 5 kids is too many kids! The infrastructure was designed for 2 children per family. More than that puts a strain on the infrastructure that affects everyone. It’s not fair. Ah ok! Good to know. I’ll get rid of three of them. Thanks, Gale! Excellent idea. Give them to people who can’t have children. This is the rudest and most offensive comment I’ve seen on a personal blog. Would you say that to someone’s face? Not to mention what Adrian is accomplishing with his crew is way more efficient in an the inefficient infrastructure the rest of us tend to live in. Yes, I would say that to someone’s face. Who are “the rest of us”? Clearly, you assume that everyone is exactly like you and that your clones are the majority. What incredible arrogance! Sorry Gale, I will take it down a notch. I was surprised by your honest comments – I do read a lot of blogs and rarely comment or defend but clearly I touched a nerve. I generalized about “the rest of us” so I’ll speak for myself – I’m not sure how you know I’m a breeder and by no means do I think the world revolves around child-producing females and their offspring. I would applaud you for whatever your choice is too (or empathize if it’s not a choice), just as I applaud Adrian. My point was just that I have huge respect for Adrian and what he’s attempting to do to make his footprint smaller, and as it’s much smaller than mine with 2 kids and 2 cars in the suburbs, I’m inspired which is what I read blogs for – to be inspired and to open my mind to the world around me, especially those that live differently than I do. Peace. I used to live in that exact same condo building! I always thought the units were quite spacious. I think the house I gre up in as a child was about the same square footage. And of course, we used the den as a bedroom too. Though the space seems too narrow somehow you made it seem big and full of life and that’s what homes should look and feel like. 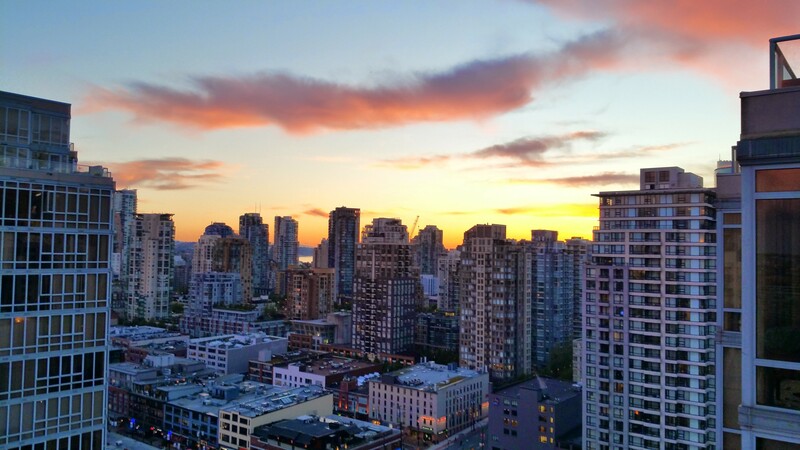 Renting a condo is a like a start up for your future and where planning takes place.